Our Makerspace is our newest space, where you can create! The Makerspace will continually gain more equipment and resources, to better serve our intelligent community. Next time you’re in the Library, show your interest and see what’s new! 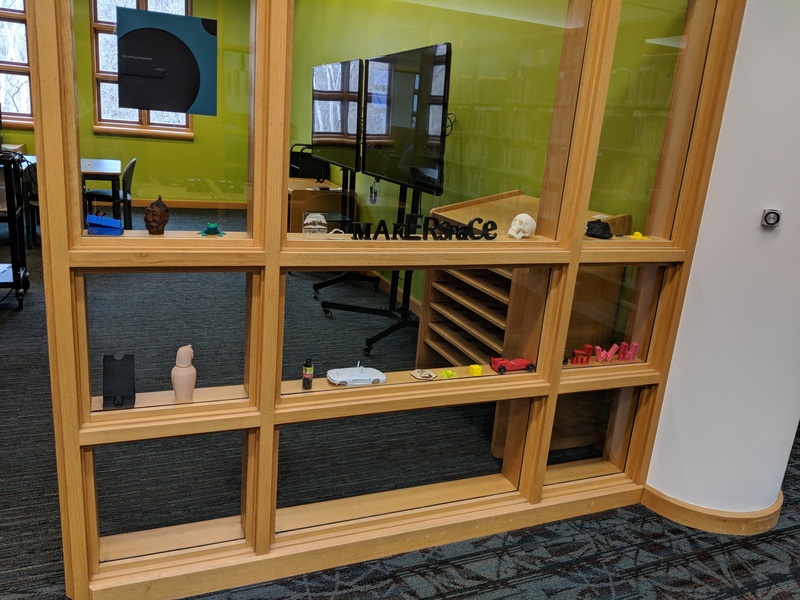 The Makerspace provides 3D printing services! If you have an item you would like to be 3D printed, please provide us with your 3D model files, and some information about what you’re printing. Your print will be added a queue, and we will contact you to pick it up when it is done! For all information about our 3D printing services, click here! Click here to send us your 3D Model for printing. Or, just bring us your 3D model on a USB drive (or other data storage device) during Lab Hours. Please click here to review the 3D Printing Policy before you send your model. All prints typically cost $.20 cents per gram. Users will also incur a fee of $.50 cents per hour beginning at 4 hours. This may change according to material type. Once your print has completed, it will be weighed to determine the total cost. 3D printing is the process of creating a physical object from a digital model. It is also known as additive manufacturing because the physical model is built one layer at a time from the bottom up. 3D printing provides an opportunity for everyone to take an idea from their imagination, design it, and create a physical model. RHPL is actively building a community environment that nurtures creativity while stimulating and supporting learning and innovation. Click here to learn more about 3D Printing technology! What types of 3D printers are available? The LulzBot Taz 6 and the Lulzbot Mini are available at RHPL. Filament options: Materials that can be used include: PLA, HIPS, PVA, wood filled filaments, Polyester (Tritan), PETT, bronze, copper, stainless steel-filled filaments, Polycarbonate, Nylon, PETG, conductive PLA and ABS, UV luminescent filaments, PCTPE, PC-ABS, Alloy 910, and more. (Users who require filament besides PLA will have to provide their own material, and must be approved by library staff). Library staff reserves the right to determine whether or not a print can be completed with the requested material. ABS, PLA, HIPS, PVA, wood filled filaments, Polyester (Tritan), PETT, bronze and copper filled filaments, Polycarbonate, Nylon, PETG, conductive PLA and ABS, UV luminescent filaments, PCTPE, PC-ABS, Alloy 910. (Users who require filament besides PLA will have to provide their own material, and must be approved by library staff). Library staff reserves the right to determine whether or not a print can be completed with the requested material. We recommend the free, browser-based program called Tinkercad for beginners. Other free programs are Blender and Sketchup. Designs can also be downloaded from Thingiverse, a design community for sharing 3D printable objects. Whenever we’re open, we’re happy to show you our 3D printers, and answer any questions you have about this fascinating technology! We have 3 Vinyl Cutters available. A Silhouette Cameo 3, a Silhouette Portait, and a Cricut Explore Air 2. Click here for more information on Silhouette! Click here for more information on Cricut! Materials all of the available vinyl cutters can cut Vinyl, Heat Transfer Vinyl, leather, fabric, paper, copy paper, card stock, adhesive paper, foil, craft foam, sticker sheets, vellum and much more. What material can the Glowforge cut/engrave? Glowforge can cut wood, fabric, leather, paper, Plexiglas (acrylic), Delrin (acetal), mylar, rubber, fiberglass, Corian, foods, and more. Glowforge can also engrave all of the above plus glass, coated metal, marble, anodized aluminum, titanium, some phones, tablets, and laptops, and more. What is the thickest material Glowforge can cut? PLA – A versatile, durable plastic. Made from plant starches. The most popular material for 3D printing. Available In: Black, White, Grey, Red, Orange, Yellow, Gold, Light Green, Dark Green, Turquoise, Transluscent Blue, Purple, Pink, and others. The library can provide PLA to you, if you do not have any materials. We allow printing with other materials incuding: wood filled filaments, Polyester (Tritan), PETT, bronze, copper, stainless steel-filed filaments, Polycarbonate, Nylon, PETG, conductive PLA and ABS, UV luminescent filaments, PCTPE, Pc-ABS, and Alloy 910. These other materials may be approved upon request and the customer must supply the materials. Please remember you will be charged by weight per gram. Printed items are based upon finished weight. $0.20/gram, plus $0.50 per hour of print time beginning at four hours. Every effort will be made to verify print and pricing within two business days of submittal. Payment for materials must be received before the item is printed. Maximum print size is 280 mm x 280 mm x 250 mm (11.02 inches x 11.02 inches x 9.8 inches). Heat transfer vinyl: $2 for use of one sheet up to 72 square inches; $4 for use up to 144 square inches. Additional sheets/colors will incur additional charges. Adhesive vinyl: $0.75 for use of one sheet up to 72 square inches; $1.25 for use up to 144 square inches. Additional sheets/colors will incur additional charges. Payment for materials must be received before use. Library staff will work with the patron to provide an accurate estimate of costs before payment. Patrons must bring in their own materials to use in the Glowforge. The library does not provide any laser safe material. Materials that can be used in the Glowforge can include: Glowforge can cut hardwood, acrylic, plywood, leather, fabric, paper, Plexiglas (acrylic), Delrin (acetal), mylar, rubber, fiberglass, Corian, foods, and more. Glowforge can also engrave all of the above plus glass, coated metal, marble, anodized aluminum, titanium, some phones, tablets, and laptops, and more. Library staff must approve the material before it is used in the laser engraver. $0.15 per button set (mylar, shell, and pin back). Printing costs are extra, at the current library rate. Payment must be received before use. Patrons must bring in their own materials to use with the VHS to DVD converter. The library does not currently provide recordable DVDs. We have 2 high definition monitors, with high processing computers available for public use. We also have several high processing laptops available when these computers are in use. Patrons are welcome to stop in with their projects during open hours or make an appointment with the makerspace specialist. If you have an item you would like to be 3D printed, please provide us with your 3D model files, and some information about what you’re printing. Your print will be added a queue, we will calculate the total cost, and contact you to pick it up when it is done! To pay for your print request, you can pay in person when you pick up your item, or you can use this form to pay online!